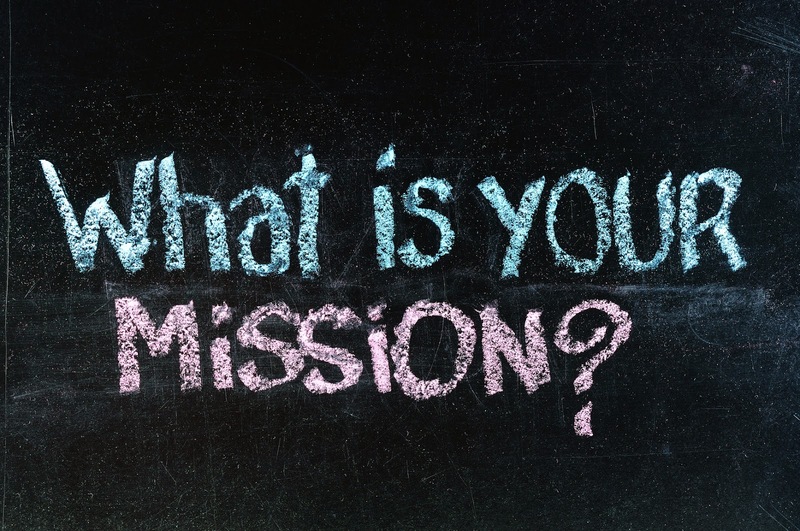 Can you, in 25 words or less, articulate what your mission in life is? Have you ever put thought into it and boiled it down? In one of my book ideas, Spiritual Self Employment, one of the things I advise self-employed people to do is to write a mission statement of what they want to get out of their job. For my copywriting job, it would be "to build relationships with appreciative clients in diverse industries and help promote their businesses in a way that challenges my skill, strategic knowledge and creativity." There have been a couple of times over the past 15 years when I've needed to revisit that mission statement in order to make tough, but healthy changes in my client list. What sometimes held me back is that the clients I was considering walking away from were my biggest ones. Having the mission statement helped, because it says nothing about money and everything about the things that build esteem, happiness and pride in my work. Therefore, staying in a situation that didn't challenge me or where my work wasn't appreciated would be counter to my mission, regardless of how much they paid me to do it. Fortunately, that's not a decision I've had to make in a very long time. All of my clients are long-term clients who show their appreciation for my contributions and who trust my input. I consider myself fortunate, but it's not about luck. It's about knowing what I want to accomplish and how I want to feel and not settling for less, combined with my ability to provide the kind of relationship and deliverables my clients want. The right match is made in the universe, not through chaos, but by design—by people knowing what they want and sticking to it. I think the biggest mistake professionals can make is to maybe have a rough idea of what they want to accomplish in their minds, but never write it down. In that scenario, they're only going to get a rough idea of what they want. Writing things down not only makes things official in the universe, it also gives you something to refer to when faced with choices. Keeping it concise forces you to really think about what's most important to you. Then when you're faced with a tough decision, simply pick up your mission statement and, all of a sudden, a tough decision becomes simple. Mission statements keep you focused on your objectives. Best of all, nobody ever has to see yours but you. From parenthood to volunteerism and all the other things I've mentioned, we often move through life making decisions and adapting to circumstances without having a clearly defined umbrella under which to do it. And, honestly, there's nothing wrong with that if you don't mind getting wet from time to time. But a lot of the chaos and guessing we do along the way can be eliminated if we just take the time to sit down and define what we're doing it for and how we want to do it. I think my spirit self would be disappointed in my human self if I was down here 70-some years and never and never asked the question, "what do I really want from this human experience?" We spend our time here accumulating possessions and experiences, but how much of it really fuels our soul? And how will we ever know to fuel our souls if we never think to just sit down and ask? I've been thinking about my mission statement a lot since you posted this. Thank you for the push, it has really helped clarify where I want to go over the next few years. And that clarity helped give me the courage to ask for what I wanted, approaching someone I'm a bit in awe of. She said Yes :D It's just one step, but I'm also taking others. So, yes, I found this powerful. Thank you! Oh, I'm so glad to hear this helped! Hooray! Thanks for letting me know.